Salvador B. Castro, presente | Real in L.A. I picked up the LA Times one day in April and read the lengthy obituary of a fiery Chicano educator of the 1960s named Sal Castro. Looking at the photo, I realized Sal was a neighbor, the beefy guy who worked in an office in his garage and whom I saw, when the door was up, on my neighborhood walks. 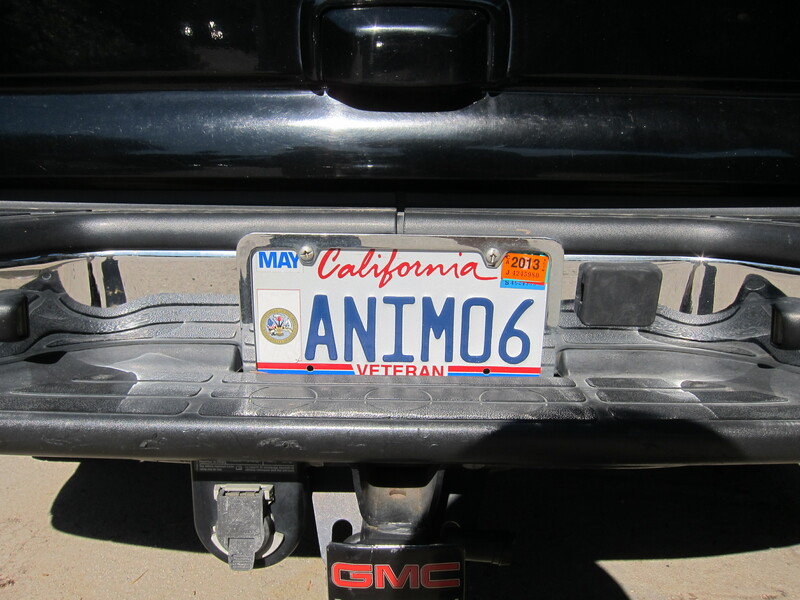 The guy with license plates reading ANIMO (which means “soul” in Spanish, and could also mean “courage” and “encourage”). The heavy-browed guy who never said hello or smiled. His identity was confirmed when a poster appeared in front of that same garage announcing a memorial service. The Times even covered his funeral at the cathedral downtown attended by 600 people, including Mayor Antonio Villaraigosa. 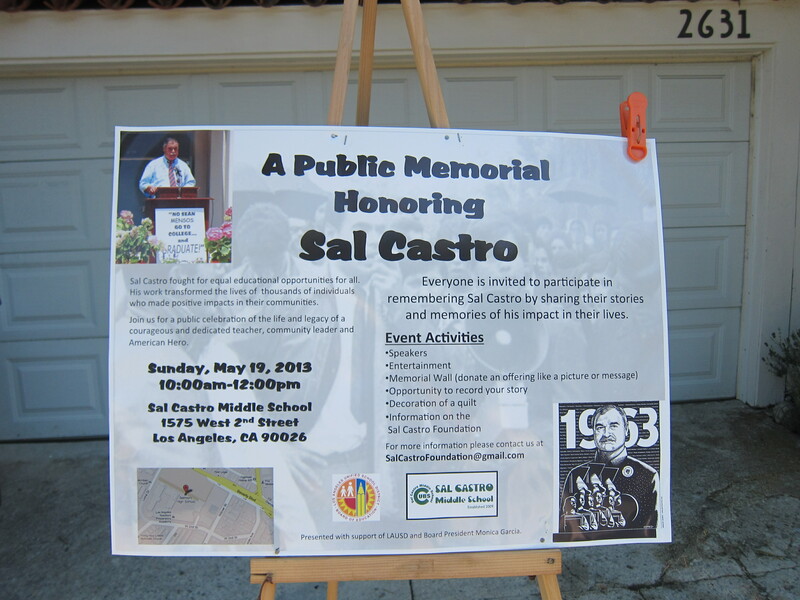 Sal Castro would have had stories to tell if I had known who he was and had had the courage to ask. According to his obit, in the late ‘60s Castro was a brand new LAUSD social studies teacher who encouraged his Chicano students to speak up about the overcrowded and run-down schools, lousy teachers, sky high dropout rates, and counselors who thought Latinos belonged in auto shop, not college-prep classes. In what became a formative event in that era’s Chicano Movement, 1,000 students at five high schools walked out of class March 5, 1968, sparking a broader protest that spread to 15 schools over several days. (Villaraigosa was one of those students.) That landed Castro and 12 others in jail on conspiracy charges and he lost his job. After parents protested, Castro was rehired by LAUSD but was moved from school to school as a substitute for several years until finally being assigned to Belmont High near downtown. He taught at Belmont for more than 30 years until his retirement in 2004. Castro apparently had a secure identity and Chicano pride at an early age. Born to Mexican immigrants in Boyle Heights, Castro started school in Mexico, learning to read in Spanish. When his parents returned to LA and Castro entered second grade, his teacher sat him in a corner because he couldn’t speak or read English. Fortunately for thousands of Chicano students, Sal Castro channeled his anger at dumb teachers into challenging L.A.‘s racist educational system. He received national attention for his work in 2006 when Edward James Olmos directed an HBO movie, Walkout, about that period of his life. And it seems LAUSD finally forgave him his bold and outspoken ways: in 2010 the institution sharing Belmont’s campus was named the Salvador B. Castro Middle School. You are currently reading Salvador B. Castro, presente at Real in L.A..